After 5 years, we got to experience the magic of Rajkumar Hirani's style of cinema. Since 3 Idiots, there has not been a single movie that could have touched audience's heart in the same way. PK is a magical movie lying in the genre of "fantasy". The very first scene has Aamir Khan walking without clothes. The expression that he carries on his face states what kind of phenomena we are going to experience for the next 3 hours. PK seems to start from where Ohh My God! (starring Akshay Kumar and Paresh Rawal) ends. Hirani makes us realize the worm that is killing the society. He is successful in showing how religions are been formed and how every religion has its own rule. If someone belonging in no religion lands up on Earth, how confused and crazy he would look. 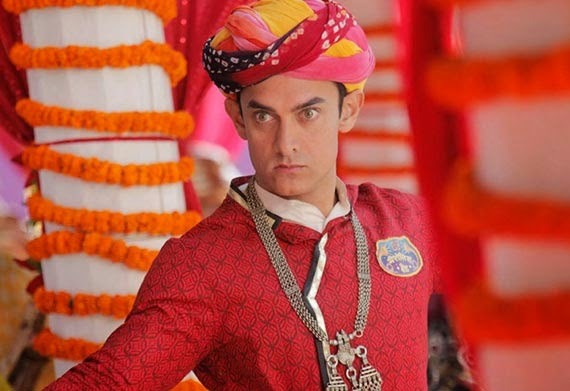 PK is all about Aamir Khan searching for the right God who can fulfill his demand and bless him with what he desires. A very difficult topic handled very greatly by Hirani that it cannot offend anyone. The direction is more than perfect considering how each scene has been approached. Not even a single minute where you would feel that the movie is losing its script. Director keeps the movie entertaining in every shot and also compels us to think about our choices and superstitions. The script is so strong that movie revolves around the same plot but with many vivid scenes, miscellaneous characters and intriguing sub-plots that with each minute, the thought that you are watching one of the best cinemas keeps hitting your mind. Songs are also synchronized perfectly with the story. They don't let the movie become stagnant but only takes it ahead. The camerawork and VFX are also spectacular. The first scene and the climax tells a lot about it. Aamir Khan is an absolute mind-blower. People criticized his same expression look in Dhoom 3 but with PK, he makes his point strong that with one expression itself, he can express everything that he wants to convey. He makes you laugh, smile, cry and think throughout the movie. You feel so strongly about his character that after a point even you feel that there's a bit of PK in yourself too. Anushka Sharma is a real show-stopper. Her acting, playfulness, strong dialogue delivery and body language makes this movie even more stronger. At times, she makes PK look better than he actually is. Sanjay Dutt is lovely in his supporting performance. Saurabh Shukla plays a godman/villain in this movie and does his job perfectly. You want PK to ruin him nationally. Haha! Sushant Singh Rajput in his cameo is also charming. Boman Irani has to be a part of Rajkumar Hirani's movie and he is just okay in his role. Summarily, PK has an amazing script supported by superb performances and driven by perfect narration. After 3 Idiots, if there's any sensible cinema released with this budget and big names, it's undoubtedly PK and nothing else. I give the movie 4 stars out of 5. A very powerful attempt. PK has a repeat value hence you can watch it not only once but again and again. That's the real power of the movie. Go For It!!! MY TEN FAVORITE MOVIES OF 2014!!! TOP TEN BOOKS RATED BY ME IN 2014!! !